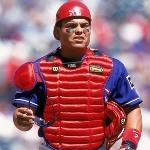 Former Puerto Rican catcher Ivan Rodriguez, who will join the Baseball Hall of Fame this Sunday, will become the youngest living Cooperstown inductee. The 45-year-old Rodriguez spent 21 in the Major Leagues, most with the Texas Rangers. His debut, five months short of turning 20, was with the Rangers on June 20, 1991, against the Chicago White Sox in a game where he had a hit and two RBIs in four at-bats. No other catcher in Major League Baseball history won as many Gold Gloves (13) as Rodriguez earned during his career. “Pudge” caught 661 runners trying to steal a base, that’s 46 percent of the runners who decided to try his arm. Even more amazing, Rodriguez was behind the plate for 2,427 games and made 12,376 outs, both numbers MLB records. As a catcher, he had a superb defense, but his bat was also something that the teams that hired him could count on. Rodriguez, a 14-time All Star had a very respectable .296 batting average and his 311 home runs earned him seven Silver Bats. Rodriguez was the American League MVP in 1999 and a World Series champion with the 2003 Florida Marlins. He will be just the second catcher in MLB history to be elected to the baseball Hall of Fame on his first ballot, after his idol and former Cincinnati Reds legend Johnny Bench. Former players Tim Raines and Jeff Bagwell were also elected to the Hall of Fame. Front office executive John Schuerholz, who helped build the 1985 Kansas City Royals and 1995 Atlanta Braves; and Bud Selig, commissioner of Major League Baseball from 1992 to 2015, were elected as non-playing personnel who made their greatest contributions to the sport after 1987. With Rodriguez Puerto Rico will now have four players in the Hall of Fame, as he will join the late Roberto Clemente (1934-1972), Orlando Cepeda and Roberto Alomar.